If you are seeking incredible views, geological finds and a rich history, look no further than the Alum Cave Trail. 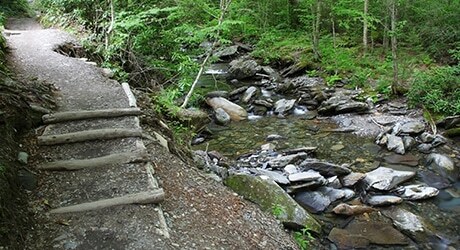 The Alum Cave trail offers a roundtrip length of over 4 miles and its highest elevation is 4,955 ft.
You can start the trail at Newfound Gap Road to reach the Alum Cave Trailhead. This trail is incredibly popular, so much so that they offer two parking lots. To ensure a spot you may want to arrive early during peak tourist season, or on any nice Tennessee weekend throughout the year. Your journey up the trail will begin with a gentle grade leading to Arch Rock, which is approximately 1.3 miles from the trailhead. Arch Rock is the first prominent landmark along the trail. You will continue your ascent towards Alum Cave, which is approximately 2.2 miles from the trailhead. Alum Cave has an incredibly rich history here in the Smoky Mountains. The Epsom Salts Manufacturing Company was established at Alum Cave back in 1838 where they mined Epsom salt from the cave. The mountain people used the Epsom salt found in the area to dye homespun clothing a reddish brown. During the Civil War the Confederate Army began mining saltpeter from the cave, which they used to manufacture gunpowder. 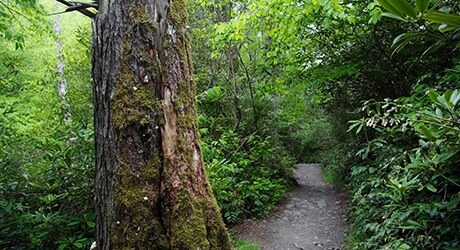 In 2015, the Smoky Mountain National Park launched a two-year project to restore the Alum Cave Trail to all its former glory. The Trails Forever crew have focused restoration efforts on several targeted locations along the trail to improve visitor safety and stabilize eroding trail sections. Crews have been improving the overall trail safety by repairing historic cable and handrail systems, reinforcing hanging trail sections and improving drainage to prevent further erosion. The trail reopened on November 17, 2016.